Additional Info: I have over 20 years of experience as a piano soloist and piano accompanist. 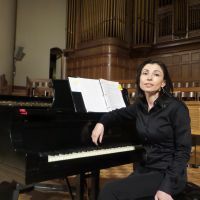 My extensive experience includes accompanying individual musicians (violin, cello, trombone, flute, clarinet, chamber ensembles, choirs, musical theatre, opera, voice lessons, singers, recording studios, 2 pianos repertoire. I started playing piano at the young age of 4. I have since graduated with honors in musical performance and instruction. My musical career path has taken me across the world from Israel to Eastern Europe, and now the United States. I have achieved high honors in musical academies and received honorable awards for my participation in classical piano solo and accompaniment. I have exceptional sight reading skills and ability to collaborate with various instrumentalists, vocalists, chamber music, choir, orchestra. I currently work as an accompanist for La Canada High School. My duties include accompanying for choirs, rehearsals, concerts, musical theater productions and assisting musical director with his responsibilities. I love my job. I am very responsible, flexible, and easy to work with, available on a short notice. My fees are negotiable depends on a project and driving distance.